Since it’s Sunday and Fabricio Werdum’s Hail Mary was answered last night, let’s take a brief moment to clarify things on a religious front. As great a MIXED MARTIAL ARTIST Fedor Emelianenko is, a God he is NOT, and the Russian is the first to admit it. After getting caught in Werdum’s lanky limbs Saturday night inside the HP Pavilion in San Jose, Cali, Fedor professed he constantly gets bombarded by misguided kids that believe a combat fighter could actually be on the same playing field as the man upstairs. Despite owning an unprecedented 31-2 professional record, Emelianenko admits he’s just a man serving THE Man’s plan. He also claims the upset loss to the Brazilian jiu jitsu black belt was a “necessity” because it was the Big Guy’s call. 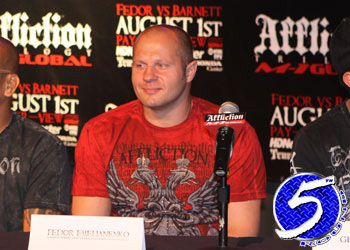 Fedor is simply hoping his fortunes will turn and he won’t experience the longest losing streak of his illustrious career when he completes his Strikeforce contract in his next outing.